Update 23rd September 2009 - please visit our news page for how to donate online on the Stanford website. Or access the special Stanford website page by clicking here. It is with great sadness that we heard earlier today of the passing of Patrick. Our thoughts and love go out to his wife Lisa and all the family. Patrick touched millions of people all over the world with his courage and strength he showed during his recent battle with pancreatic cancer. 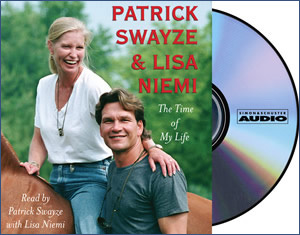 All of us here at the Official Fan Club were honoured to be able to help Patrick and Lisa over many years to pass along messages and news to fans all over the world through this website. Patrick was truly a gentleman and a gentle man. He cared deeply about so many things and on so many different levels. He loved his craft - acting - and was so proud too of his wife Lisa whom he respected as a director and fellow artist. Patrick's body of work was wide and varied as all his fans will know. Through his portrayal of all these characters, he has made us laugh or cry. From the "swivelling hipped" Johnny Castle of Dirty Dancing to the tear-jerking Sam Wheat of Ghost to the soul searching Max Lowe of City of Joy and of course to the ultimate Southern Gentleman, Orry Main in North and South. Patrick and Lisa were soulmates and our hearts go out to Lisa at this difficult time. Patrick will be greatly missed. The Book of Condolence book is now archived and available to view. We have forwarded a copy of all messages to Lisa. We invite you to view the Book of Condolence. Please note that by clicking on the "Book of Condolence" link you will be taken to a third party website which may place cookies on your computer. The Pancreatic Cancer Action Network has been in touch with us and we have agreed with them that a link from this website be created for fans to donate to the Pancreatic Cancer Action Network through the organisation First Giving. Please click on the button below to link through to the First Giving page where you can make a donation to the Pancreatic Cancer Action Network in Patrick's name to honour his memory and his courageous fight against this terrible disease. Welcome to our new home!! 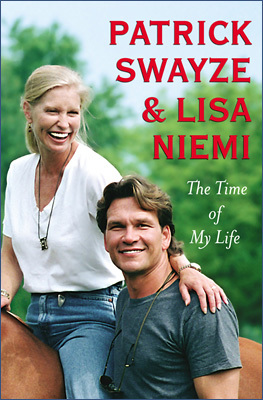 Patrick and Lisa kindly gave us permission to use the patrickswayze.net domain name and we hope you enjoy visiting us here! Light up the sky for Patrick! Name a star in honour of Patrick in the Stand Up to Cancer constellation! # 4 on the New York Times Bestsellers List! Click here to order "One Last Dance" DVD, posters and soundtrack CD from the Official Movie Merchant Website. Click here to read more about the World Premier of "One Last Dance" at the Houston Film Festival on 4th April 2003! Please note that by clicking on either the "Sign my Guestbook" link or the "Bravenet Guestbooks" link you will be taken to a third party website which may place cookies on your computer. If you wish to leave a message, please sign our Guestbook. Please note that by clicking on the "View Stats" link you will be taken to a third party website which may place cookies on your computer. Photos will be removed at the request of the copyright holder.